We’ve been doing a bit of traveling the last couple of weeks. It has had its own therapeutic purposes and it has kept us quite busy. Last week, we were able to go to see Neil Young in concert in Chicago. It was good for us to see him. Reece actually claimed that “Heart of Gold” was his favorite song, followed closely by “Ohio”. We often listened to those songs on the drive to preschool and Reece requested hearing those songs when we were driving to and from the hospital for home visits. In fact the first thing he asked when we got in the truck before taking him home that first trip back was, “Can we listen to ‘Ohio’?” While Neil didn’t play either song during the Chicago concert, it was a great show and I think an important thing for Terry and me to do. This past weekend, we went to Faith’s Lodge, which is a large lodge in northwestern Wisconsin that hosts bereaved families who have lost children. It is a place to spend time with each other in a serene setting, with other people who understand the loss of a child, and just be. The weekend was an important one for us. I do believe we will go back next year, although we will likely go to a parents’ only weekend. The ages of our girls demand much hands-on time and thus make it difficult to connect for long periods with others. However, I am glad that the girls went with us this time. I don’t care much for leaving them right now and it was really neat to see all the kids of various ages playing together. It occurred to me as the days passed that the kids that came to the lodge somehow corresponded in ages to the siblings lost by the other children. So kids and families played with each others’ kids in a therapeutic way…or at least that is how it felt to me. There weren’t any five-year-olds there, but there were many boys there older than Britta. It was bittersweet to see them running laps around the room, pushing oversized dump trucks and Cars vehicles, much like Reece used to do. Britta naturally gravitated to them. I noticed other families doing the same with both of our girls, although it may not have been a conscious thing. It was different from a regular playdate with other families. While I would never wish the loss of a child on anyone, it was important to have that time with other people who “got it” and who probably felt those bittersweet twinges in a real way right along with us. No one there discussed it with me, but then again, no one had to. If you’ve been through it, you understand–there’s no reason to discuss it. And that type of understanding is priceless. There is this really beautiful area on the property where people paint stones with their child’s name on them and lay them near a bridge. 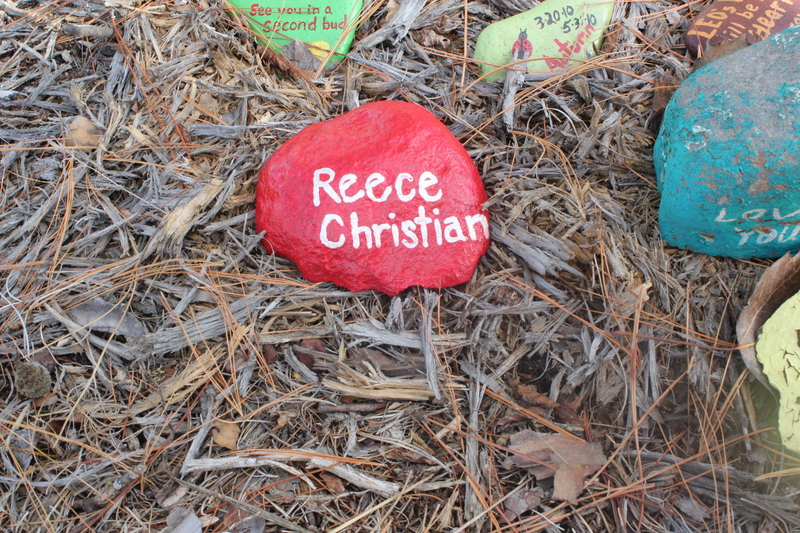 We painted a stone for Reece. I think if he is aware of the stone (which I believe he is), he probably really likes it. There is typically some period of time, before you add a child to your family, for preparation, planning, and adjustment–be it via pregnancy or the adoption process. It makes sense to me that after the loss of a child, the time immediately following would be an intense adjustment period as well; perhaps it never ends. As I discussed with one of the other mothers this weekend, right now it feels perfectly alright to be broken. I feel like we were operating in such a heightened survival mode for so long that now, the feelings of the trauma and exhaustion are catching up. No one can fix it or make it better and I don’t want anyone to try to do so. I guess this part of life demands brokenness and that brokenness has its own purpose. We need to assess the damage before we can try to put anything back together. Sometimes things can’t be made right and sometimes the holes that are created can’t be filled. I’m not interested in filling the hole and I’m not interested in even attempting to go back to the way things were. I’m not the person I was a year ago and I’m never going back. I have been on a quest of sorts these last few months to figure out how our situation with Reece will be used in our lives. I love hearing from people about how Reece’s life touched their own; I know our Reecie had a big impact on this world and will continue to do so. He fulfilled his purpose here and I know we will hear about some of it, but that most of it we likely will not. I don’t believe that we were given this unique path as Reece’s parents to have it go unused in our own lives, though. Part of my desire to figure out what is in store next is that one doesn’t lose parental energy for a child that has passed away. I haven’t lost the energy that I have specifically for Reece and I can’t just redirect it to my other kids. It has to go somewhere and I want that “somewhere” to be a productive and positive thing. It is slightly ridiculous that I am rushing to figure this out–it’s probably a knee-jerk grief reaction to scramble; if I have learned anything it’s that God has perfect timing for everything, including this part of the plan. Still, I think I have a fair amount of paranoia that if I don’t figure out something productive to do with the energy, it could become destructive. But I’ll save those thoughts for another post. Another part of my desire to know what is next in store is that I want to figure out my life’s purpose in some sort of attempt to figure things out earlier on in life, versus wasting time on the non-essential. Somehow in my mind I hope that perhaps the Lord will mercifully spare me from a prolonged life here by doing so; maximize my time in some sort of way. This last statement, I can already tell as I re-read it, could be largely misunderstood. I’m not suicidal or ungrateful for my life. I love my life here–love my husband, my kids, my family, and who I believe God made me to be. But I believe to my core that this is not our final place–that God has a purpose for each of us on earth and that once it is fulfilled, our time here is done. This strong belief I have, coupled with my grief state over Reece, leaves me feeling urgent to figure out the rest of the plan (an impossible task, really) so that my time here won’t be living until a ripe old age. At the same time, I know a big purpose of mine is to raise my girls in a God-honoring way and to help them understand how Jesus loves them. And I thoroughly enjoy all of my family, so it feels conflicting to want to leave them here. Until I’ve done the part God has tasked me to do on the child-raising front, I will be here regardless. Still, I believe there is likely another part of my life’s purpose that I have yet to uncover. So I feel urgency to help life along as best I can, if that makes any sort of sense. I don’t want to take a lackadaisical attitude that prevents me from seeing Jesus and Reece for one more day than necessary. That may seem bizarre, but if you walked in my shoes for five minutes, you would understand the constant pull Heaven-ward on a daily–no, hourly, and at times minute-by-minute–basis. I suspect when my girls (God-willing) graduate high school and move out, it will feel like a watered down version of this. Heavily watered down, that is. On an encouraging note, I feel like I may have received some clarity over the last couple of weeks regarding what I am supposed to be doing going forward. I am still praying about it, because it is admittedly not a path that I would naturally be choosing. And since my life, especially this last year, has been full of God’s plans for me being completely inconsistent with my own desired outcomes and plans, this seems to be a sign that it may in fact be the right thing. This area of what I believe I am perhaps being called to do seems to make a lot of sense to me in light of all that has happened and our desire to make some sense out of it. The most I can say right now is that I do feel it involves writing. So I thank-you for your continued prayers in this area, as sorting through this will be an important part of the healing process for me. I also thank-you for your continued prayers for our family. Another day has gone by and we are floating through life in a somewhat normal fashion. I took Britta with me to the gym for the first time since December. She did not remember being there, despite the many hours she has played there—with and without Reece. Reece spent many, many hours in childcare there and very much enjoyed himself. We go to the YMCA which, in my opinion, has superior childcare to any other workout facility I have been to in the metro area. In fact, the staff that watched Reece sent our family a lovely card after he passed away to express their sympathy. Upon seeing us today, we briefly discussed Reece and they encouraged us that they were glad to see us back there and also excited to meet Scarlett in the near future. I have come to the conclusion that avoiding places and things that remind us of Reece is overall not the right way to go—at least for the time being. My knee jerk reaction after Reece passed was that we needed to switch gyms, sell our house, trade in our cars, and generally avoid many places where we have memories of him. Now I have begun to think about it differently. I love the memories I have of him. Sometimes they feel painful and sometimes they make me feel content. Regardless, if I avoid anything associated with Reece that may bring back memories, I am afraid said places will become untouchable, only painful, and never approached in a healthy way. Likewise, I have yet again accessed the advice of our good friend, Brad, who told me nearly a decade ago that it is quite alright to “sit” in whatever emotional place that the moment brings. I’m finding that grief is an interesting (for lack of a better term) animal. It washes over at certain times and in many unexpected ways and forms. However, I refuse to avoid it, let it fester, and grow into something more problematic. Grief is purposeful and isn’t the problem; avoiding grief is. I have also concluded that I’m not sure I would read my blog if I was someone else, because it is where I am going to sort through some heavy things. The purpose has shifted for the time being and will likely be more of a personal diary until we figure out Reece’s memorial. We want to keep it up and running and perhaps use it for other purposes once we’ve decided what to do in honor of Reece. We’ll certainly update people on how that is coming along. But other than those updates, there is no buffer of unemotional info. Everything now is more along the lines of processing grief and living regular life. This serves as a “heads up” that I will be updating the blog, but right now, it will be mostly sorting through life in a strange way. This isn’t an apology, but I am aware of the rawness of our life and I acknowledge that this blog is in transition, which is an accurate reflection of our life. I’m feeling led to post some things we are experiencing, because I flat-out can’t reintegrate into regular activities the way I had envisioned doing when I assumed Reece would make it through his transplant. At this point in time, I can’t just pick up and connect in person the way I had assumed would happen. Therefore, I hope to 1) process my feelings, 2) connect with others who may be going through something similar, and 3) keep a circle of our friends and family up to speed on how we are doing as a family. And, let’s face it, I’ve come to appreciate this space. Like I said in my last post, it feels like home. As you have probably already guessed, we received word back today that Scarlett’s bump is benign. Woohoo!!! It is a routine dermoid cyst that was growing inside the bone. I am told it is a “classic” dermoid with nothing to be concerned about other than doing two follow-up MRIs (three months and 15 months post-op) to ensure they removed all of it. If, by chance, they did not get it all, it could continue to grow. However, dermoid cysts are singular events, meaning they neither grow back (unless part of it was accidentally left behind), nor occur elsewhere in the body. It would have had to have been removed at some point, as it would have continued to grow and create spatial issues for Scarlett. The doctor was pleased that we removed it when we did. Scarlett has recovered well and is basically back to her happy, laid-back self. We are glad to be receiving good news and now are shifting our focus back to our life with our girls, managing our grief, and figuring out where to direct our parental energies dedicated to Reece (more on this last part later). I know I have been hopping back and forth on what to do with this blog. For now, I will continue to post here, versus starting a new blog. Long story short, Terry and I agree that this one feels like home. I am pleased to report that all is well. We checked into the hospital at 7:30 am and things have gone smoothly all day. Scarlett handled surgery well. She came out of the OR ready to chew her hand off with hunger and, by the time we made it into recovery to see her, she was chugging a bottle of Pedialyte. She has never had anything but breast milk, so she must have been desperate! She is wearing gauze around her head that is wrapped like a turban, so we can not see the incision site or the stitches. I asked the doctor how many stitches she received and he laughed and said, “I didn’t count!” So, it is many. The surgeon reported that the bump was easy to remove. 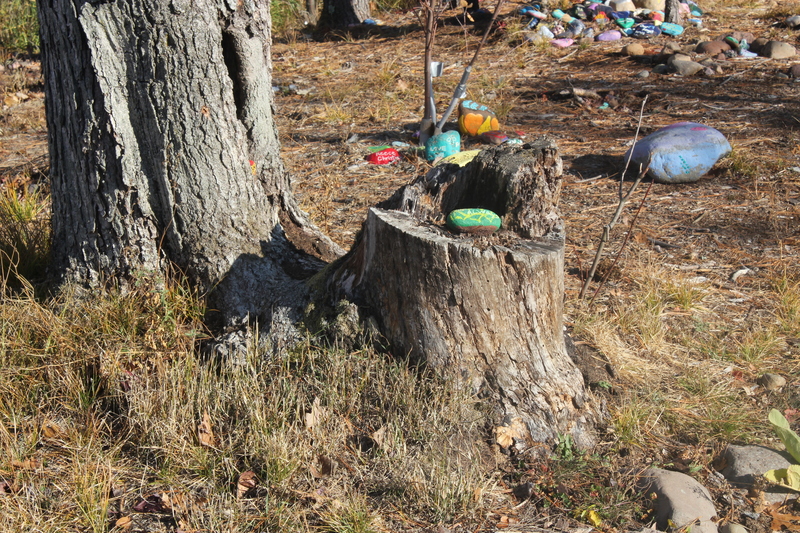 It was surrounded by bone other than the very top where the bone had eroded. He removed the bump, which seemed soft like tissue, and a small amount of bone around it. Hopefully, the test results will be back this week. He did not think the bump looked cancerous. Scarlett has been dealing with pain all day and has been fussy. We are spending the night on the general pediatrics floor, but expect to be home tomorrow. I actually wish we were in the PICU since we know the staff–but for no other reason than that. One of our favorite doctors from the PICU came to the OR this morning to greet us and said they would have liked to have us down there just because of the relationship we have with them. Thankfully, Scarlett has no medical necessity to be there, so we are now on an entirely different floor and having a blessed and mostly uneventful evening. I just wanted to update you all that things are going well for Scarlett and tell you that we appreciate all of your prayers and support. It looks like we are all set for tomorrow at Amplatz. It should be another interesting morning with the NPO restriction in the morning (nothing to eat four hours prior). With Reece we could at least talk about why he couldn’t eat beforehand…there’s no reasoning with a baby. We check into the OR at 7:30 am and Scarlett will be in surgery around 9:30 am. The whole procedure should last about 40 minutes, but the OR part will last the full morning with pre-op and post-op. The surgery would be shorter, but since they are making the incision towards the top of her head (so the scar will be underneath her hair) versus on the temple, it will take a bit longer. She will be intubated again, but that went well last week, so hopefully all will go smoothly again this time. After surgery we will be spending the night; we are told this is for pain management purposes. If things look satisfactory the next morning, we should be home on Tuesday. We have never been in the hospital for a short stay, so I am hoping this will be the case for us this time! Something new perhaps? Testing on the bump should take about five days, so I assume we will know the official results next week. I was thinking about the long waiting period we had for Reece’s diagnosis and how at the end of it, we received tough news. I don’t want to envision any news of any sort–good or bad–with Scarlett. I want to take it day-by-day and not think about it. The most practical thing I learned from Reece’s hospital stay is that we are only given this one day; we’re given this one moment. Don’t worry about the next day. Or, as our pastor says, you wake up every morning with a fresh bucket of mercy that God has given you for that day. If you use today’s mercy on future worries, you won’t have what you need to get you through the present day. We appreciate all of your prayers. I’ll keep you posted. All things considered, the morning at Amplatz went well. Scarlett was a champ and very tolerant of everything. She is definitely her brother’s sister. She was a bit frustrated this morning when we arrived in that she was hungry and in need of a bottle. She was given a pacifier and fell asleep for the remainder of the waiting period prior to anesthesia. She handled the MRI well–including intubation–and came out of sedation a happy and hungry girl. We met with her doctor a few hours later. While the radiologist had not yet read the MRI, the neurosurgeon felt that the bump did not look “aggressive”, which means he does not believe it is cancerous. Again, there is no way to know until they remove it and test it. He gave us the option of either having it removed in the near future or waiting to see what it does. The “wait-and-see” option is not even on our radar screen. We are bringing her in this coming Monday to have the bump removed. We are told this is a routine procedure…done several times a week. Bringing her in for surgery is not as straightforward for us as it sounds. Even though this procedure is “routine”, it forces us to be back in places that have difficult memories. It turns out that she will need to stay overnight to be monitored. The doctor said she didn’t necessarily need to spend the night, but if something happens from a pain perspective, they would be able to manage it better in the hospital, and therefore recommends that she stay at least a night. It turns out she will need to stay in the PICU for that night, since she is having an operation on her head. Yes, you read that right…the PICU. This is the same PICU we just spent 2.5 weeks in with Reece at the end of his life. But, we came to the conclusion that we know the doctors and staff there and that is worth a great deal to us. If you have to be in a hospital, it is always helpful to know who you are working with. So, we will be forced to deal with fresh feelings and hard memories even moreso than we realized. It is very, very strange to be going there again with another child and so soon after Reece’s passing. Scarlett’s surgery will come one month and one day after the day Reece passed away. However, I was thinking on our drive home that Reece would be thinking it is cool to have his sister stay in the same hospital and on the same floor, if he was here. After the bump is removed, they will send it for testing. We should know about a week later if there is anything concerning that they find. And that’s all I have for tonight because, quite frankly, I am tired of thinking about health and hospital stuff for today. Thank-you for praying for Scarlett and our family.